1. Brush clean the sweet potatoes. Boil it in a pot of water with some knotted pandan leaves. 2. Test the potatoes if cooked by poking it with a fork. It should poke thru easily if cooked. Scoop up and leave to cool slightly. 3. Then peel the potatoes skin and mash it almost smooth. 4. Add the flour together with mashed potatoes and form a dough, with some water from the boiling pot. 5. 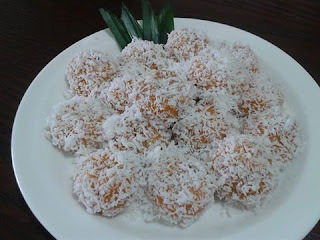 Roll the balls and insert a cube/cubes of gula melaka into each ball by pinching together to seal it. Do it gently or it may burst. 6. Start to steam the grated coconut in a tray with a pinch of salt for 5-8mins. 7. Take out tray frm steamer n leave to cool. 8. Boil a new pot of water with some pandan leaves. When it starts to boil, slide in the balls gently n cover lid, lower the heat. 9. When cooked, the balls will float up. Sieve it up onto a plate to drain dry. Then coat it with that tray of grated steamed coconuts. 10. Dish up the balls n serve. I usually prefer to do my ondeh ondehs in batches, so that once rolled will have to be boiled n served warm.